The Specchio collection is realised in a metal frame with Baroc leaf detail and precious clear and amber crystal drops. The light that comes from these pieces is incredibly scenic thanks to the mirrored bases. 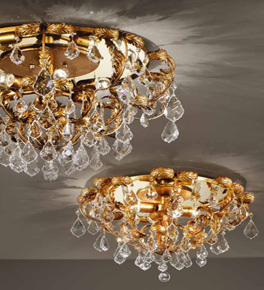 This collection includes flush fitting chandeliers, wall lights and table lamps. Specchio is Italian for Mirror.